Egly-Ouriet has been a personal long time favorite producer of mine. 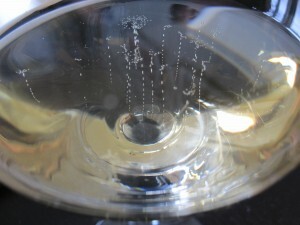 The Champagnes see long lees ageing making them very complex and yeasty. 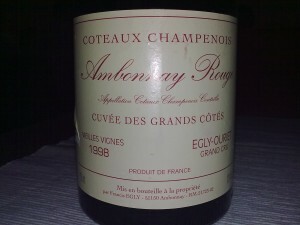 Located in the village of Ambonnay, Francis Egly owns approximately 8ha of vineyards, the majority of which are in Ambonnay. 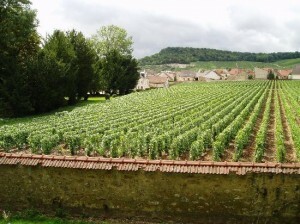 All of the vineyards are classified as Grand Cru and have the reputation for producing some of the best Pinot Noir based Champagnes. Most of the vines average between 30-50 years of age and are farmed using “common sense” principles. In the most recent years, Francis has reduced the amount of chemical fertilizers, herbicides and pesticides. He never fines nor filters his Champagnes. This specific wine is a still red wine made with Pinot Noir. I am told that Egly-Ouriet produces some of the best wines in the Coteaux Champenois under the guidance of Dominque Laurent. Only about 200 cases are made. 12% Alcohol. Appearance: Classic light Pinot Noir color with medium plus intensity. I was in a dimly lit place so I can’t be very precise with the appearance. Nose: Sweet smoke, cedar, oak and minerals. Ripe cherries, red licorice and raspberry. The bouquet reminded me of the small candies and anise seeds you get when you leave an Indian restaurant. Some hints of forrest floor and leaves. Quite complex on the nose. Hints of tobacco. Intensity about medium. Palate: Cedar and smoke. Raspberries and those same small Indian candies and anise seeds I got on the nose. Great acidity with medium plus length. Good concentration while remaining light and fresh. Great structure with mild oak tannins. Sour cherries. Very elegant. Hints of dried sour plums. This is a very elegant wine with still dominant, sweet, cigar box oak. Subtle hints of sulfur emerging, stinging the nose ever so slightly. Hints of rubber. Seems as though the wine is closing and the fruit becoming less obvious. The wine never quite returned to it’s initial glory. A great wine to have the opportunity to taste. I have tasted this vintage on two diferrent occassions and have been impressed both times. 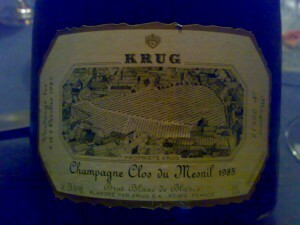 I have also tasted the 1999, but prefer the 1998 for its elegance. This is a well-made Pinot Noir that is drinking well now so if you own a bottle, drink up! 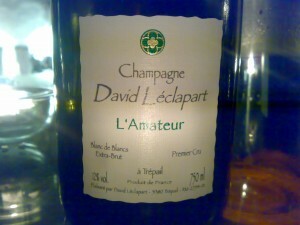 David Léclapart is a biodynamic Champagne house located in Trépail in the Montagne de Reims. Montagne de Reims is the home of the Pinot Noir grape, but Trépail is an exception to this rule. Trépail is a Premier Cru village that grows Chardonnay in the heart of Pinot Noir land. David has farmed his 2.75ha of vines biodynamically since 1998, producing a measly 7000 bottles per year in total, spread across 4 different wines. He uses minimal sulfur and doesn’t filter. This cuvée is called L’Amateur and from what I gather, it’s his “entry-level” Champagne. It’s a blend of Chardonnay grapes from within Trépail. 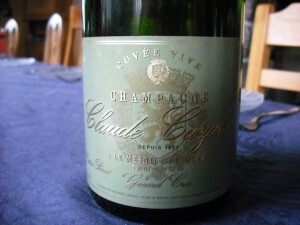 Although the vintage is not clearly marked on the front label, this IS a vintage Champagne. 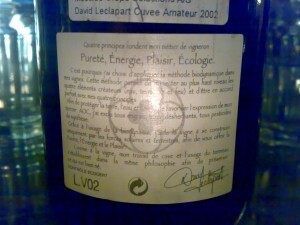 On the back label in small writting you will find “L.V02”. I don’t know how long the wine has been on the lees, but I would estimate based on purchase date that it spends around 4 years on the lees. This is an Extra Brut (less than 6 grams of sugar per liter). Nose: I have had this cuvée and vintage on at least 4 other ocassions and this Champagne has really developed in the last few years. Intoxicating flinty minerality dominates with pure green and yellow apples with some citrus overtones. Some honey notes and mushrooms in the background as you might expect to find on a developed Chardonnay. Palate: The best way I have come to describe this Champagne when I have tasted it in the past has been to describe it as a very well made, unoaked Chablis with bubbles. Think Louis Michel or Daniel Dampt and you’ll get it. Ton’s of fresh minerals, yellow apples and hints of flint on the palate. Fine and elegant bubble structure. This is what I call a transparent wine. Everything is as it should be and easily understood. The fruit and structure are clean. It’s like cooking that fresh meal using the freshest of ingredients and being able to taste every single one of those ingredients. This is why I like naturally made wines. You can taste what should be in the bottle. David respects four principles: purity, energy, pleasure and ecology. And, this is evident. Some say that Champagne doesn’t develop well when it’s given a low dosage (of sugar in the form of grape must) after dégorgement, but this Champagne with it’s very low dosage has developed marvelously and is simply put, is impressive. 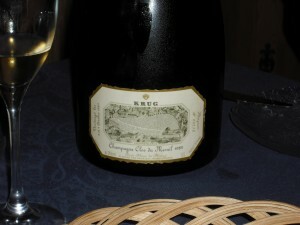 I have always loved this Champagne and this experience was no exception. I did feel however, that it was at or very near it’s peak, so if you find a bottle of the 2002, buy it, drink it, enjoy it! 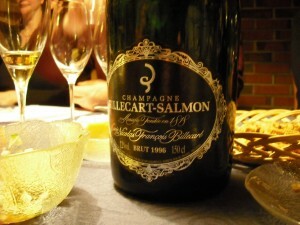 This has always been my favorite Cuvée from the well-known Champagne house Billecart-Salmon. They also produce a benchmark Rosé (many think that the name Salmon is the name given due to its color) that is a favorite among many Rosé Champagne lovers. Located in Mareuil-sur-Aÿ in the Valée de la Marne, this house was founded in 1818 by Nicolas Francois Billecart and Elisabeth Salmon. 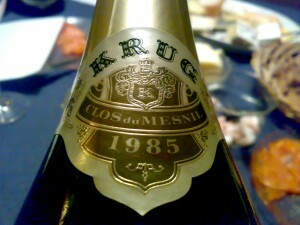 This is cuvée was created in 1964 as a tribute to the House’s founder. It results from the blending of Grand Crus from the classified Côte des Blancs vineyards (Chardonnay – 40%) and the Montagne de Reims (Pinot Noir – 60%). Alcoholic fermentation is carried out in steel at a very low temperature of 12C (about 54F). After the malolactic fermentation, this wine is left to age on the lees in the bottle for at least 6 years (this was the amount of time for the 1/2 bottle, so the magnum could have been on the lees longer) before dégorgement (the process of freezing and removing the end of the bottle to extract sediment after the second fermentation of a sparkling wine). On the nose: Fresh white toast, in other words, lots of autolysis (yeast). Fresh red apples and some minerals also appeared on the nose. After some time being opened, I got the sensation of roasted duck breast on the nose as well. 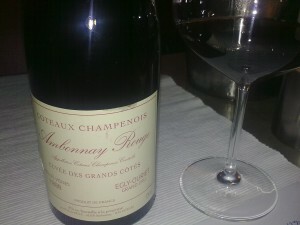 On the palate, this wine was extremely well balanced and extremely young and well-balanced. Excellent concentration of red apples, yeast and minerals. 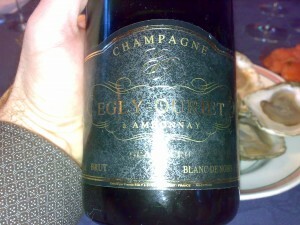 This Champagne is extremely drinkable now, but in my opinion has huge cellaring potential. Keep in mind that this was a Magnum (150cl) and the 1996 vintage is considered by many to be one of the finest vintages of the century. 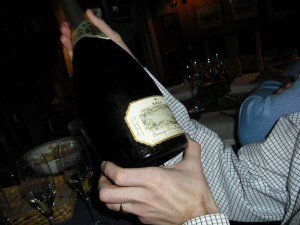 Magnums tend to age more slowly and are referred to by many as the bottle size of choice for Champagne’s and other wines.